I made this card in response to the technique challenge at Patty's Stampin' Spot. I don't do cards like this often and to be honest, I'm not so sure how much I like this one, but here it is anyway. 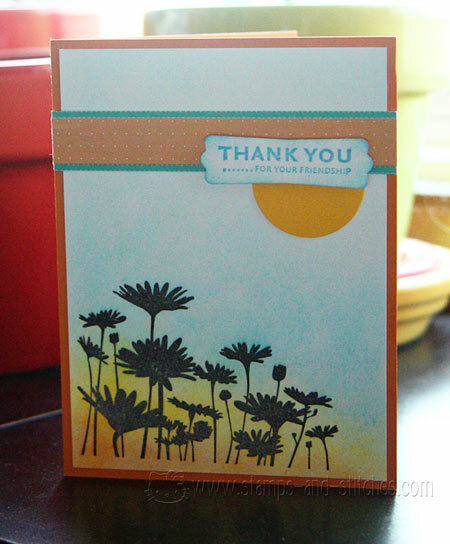 I used the Stampin' Up Upsy Daisy set and stamped it with black pigment ink and clear embossed. Then I sponged ink on it (Stampin' Up Pumpkin Pie, Summer Sun and Cool Caribbean). The sentiment is from the same set, stamped and inked with Not Quite Navy ink and punched with a tag punch. The patterned paper is from a couple of Stampin' Up mini paper packs. The sun is punched from Summer Sun card stock. The sun was my son's idea-I wasn't happy with the card and he thought maybe it needed a sun. It does look better with the sun. I'm LOVIN' IT!!! Really like the sponging on here and you've inspired me to get out my Upsy Daisy stamp again! Beautiful card. Very pretty Gale!! This is an amazing technique! I think you did a stand up job on this beauty! Wow so pretty! The colours on the background are so pretty. I love this! So pretty! I've been toying with doing some ink resist cards for a swap. Great job! HI Gale... I tried to find your email address on your blog and I'm not finding it (must be blind, sorry), but i wanted to tell you I selected YOUR entry as the winning entry for my Monthly Technique Challenge!! Please email me your address at: pattystamps@comcast.net ! :) whohoooo!